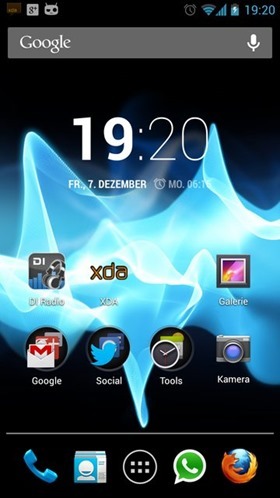 Android Debug Bridge (ADB) is one of the toolkits included in the Android SDK package that facilitates communication between your Android device and the computer. It offers a command line interface where you can execute a series of commands to perform certain tasks on your device. 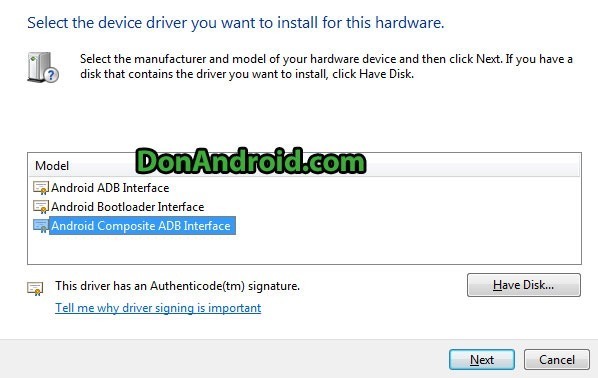 For any users who want to customize their Android devices by manipulating the OS, its very important to install ADB Interface drivers on Windows / Mac PC of yours. Here is a guide on installing ADB on Windows 7 PCs. Please note that this guide and the screenshots are best suited for Windows 7 users. However, the step may not be too different for other versions of Windows including XP, Vista and Windows 10. If you encounter any issues, do let us know in comments. You need to have Java installed on the PC. If you haven’t, you can download and install latest Java SE SDK. Make sure that USB debugging is enabled on your device. 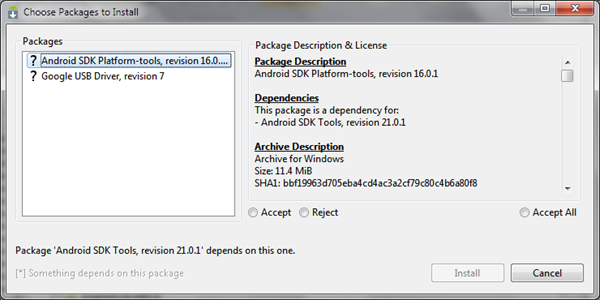 Step 1: Download Android SDK: Android SDK download link. Download the one of your choice. Step 2: If you downloaded the zip package, extract it to a convenient location. If you downloaded .exe installer, install it on your PC. For this guide, I extracted the zip file to D:\ drive. Upon extracting, it will create a directory named android-sdk-windows. 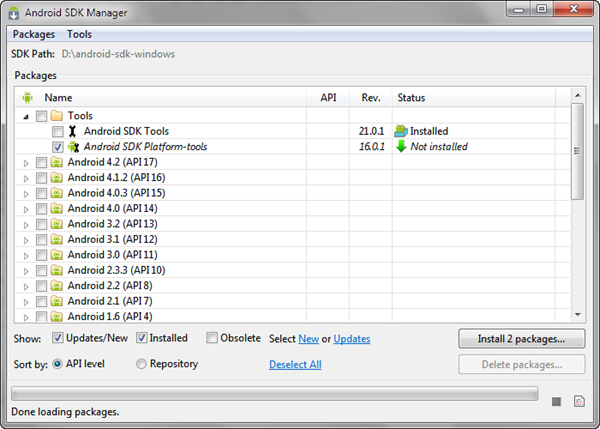 Step 3: Open the android-sdk-windows directory and run the SDK Manager.exe. It will fetch all the packages for you, wait till it’s done. From here, you can install or delete the packages. After selecting the packages and unchecking all other options, click “Install 2 packages…” button at bottom right. Step 5: A window will appear asking for confirmation. Select “Accept All” option and click on “Install” button to continue. The selected packages will now be downloaded and installed. Be patient. After it’s done, you will see the confirmation message in SDK Manager. Step 6: Now connect your device to the computer. You will notice drivers getting installed, which will eventually fail. Don’t worry. 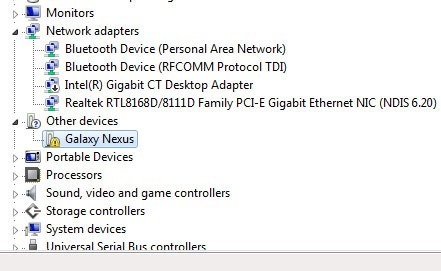 Step 7: Open Device Manager and locate your device under “Other devices”. 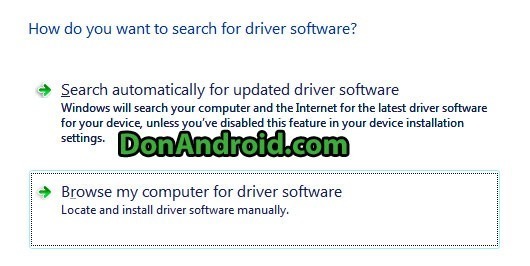 Step 8: Right click on your device and then click on “Update driver software”. Step 9: Now click on “Browse my computer for driver software” option. Step 10: In next screen, click on the option “Let me pick from a list of device drivers on my computer”. Step 11: Now select “Show All Devices” option and click the next button. Step 12: Now click on “Have Disk…” button. A window will pop up, click the browse button and browse to following location: D:\android-sdk-windows\extras\google\usb_driver and select android_winusb.inf file. Note: If you installed / extracted the Android SDK to a different location, browse to that location instead of D:\. Step 13: In next screen, select “Android Composite ADB Interface” and click the “Next” button. Step 14: Confirm installation by clicking “Yes” and “Install” if you see any warning messages appear in Windows. Step 15: Android ADB drivers on Windows will now be installed for your device. You will see a confirmation message. Step 1: Make sure your device is connected to the PC. Step 2: Navigate to D:\android-sdk-windows\platform-tools directory. Step 3: Hold Shift button and right click anywhere on screen. Step 4: From context menu, select “Open command window here” option. Your device ID will appear on screen. If it does, you can be certain that ADB drivers for your device have been installed correctly. If you run into any issues, please refer to the comments section below to see the solutions posted by some of our kind and helping visitors. Good luck! What do we do if they are not installed. Every thing works until we list the devices and nothing show up on the list. Then what do we do. Hey It worked!!. Thanks a lot!! Muchas gracias, me funciono perfecto, en mi lanix s120. con android 4.2.2, en sistema w8. You saved my life (and my Lenovo tablet). Thanks man. Thanks a lot 😀 !!!!!!!!!!!!!!!!!!!!!!!!!!!!!!!!!!!! I have a problem when trying to do this and when I click on android_winusb.inf it says that the folder doesnt contain it a compatible driver for my device, a Samsung Galaxy S4 and that if the folder in fact contains a device driver to make sure its designed to work with x64 based systems. I’m running windows 7 Ultimate and I have Android Studio installed although I am not running a x64 system. Is there any way to fix this? I’m running out of options here!! I feel as though I’m so close! EstebanParker Hey did you ever fix this issue? I’m having the same problem and I would love some help! EstebanParker Hey man don’t know if you’ve figured it out already but I did. Make sure your device is connected in PTP mode. 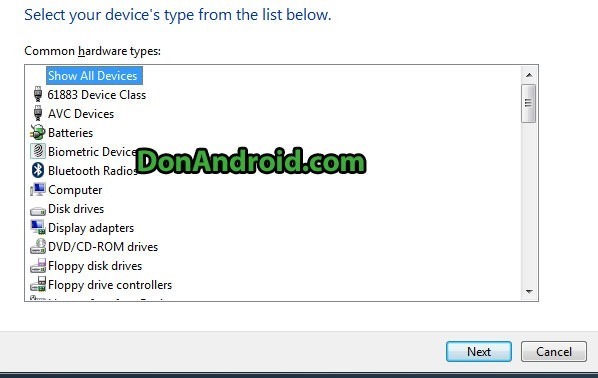 Then when you go to device manager make sure you’re selecting your device under “other devices” and not “portable devices” which is what I was doing. When you connect it as PTP there should be a little exclamation logo under “other devices” just like it shows in the article. That’s what made it work for me, let me know if it works. please help me. appeared this error. thanks. Hi thank you for your guide! But I have a little problem when trying to follow all the step you gave. I complete step 11 but at step 12, after I browse to android_winusb.inf then click ok, I got the prompt notice that it does not compatible in Win 7 X64. So how can I make it work in Win 7 X64. LexLuther same problem as mine, did you resolved it ?? newtype_smith EstebanParker i cant find “other device” i tried everything what to do? Thank you very much. Key part for me was ““Let me pick from a list of device drivers on my computer” and just click “Next” and “Have disk”. Otherwise, Windows wouldn’t find the driver even though I’ve specified the correct folder. Thanks a lot! After installing the google USB driver, my nexus 4 does NOT show up in device manager, neither as Other Device nor Android devices, Any hope? Hi Sir, when I put a check on “Android SDK Platform -tools” it is not allowing me to install the package it is only giving me the option to delete package. Please help.. Thank you got this to work on my end. Cheers!